As a painter, Julie Wolfe doesn’t rely on any single visual system. Light and color are abundant in “Language of the Birds,” Wolfe’s solo show at Hemphill Fine Arts, her third, but those qualities are sometimes all that carries over from one work to the next. If Wolfe were a bird, she would be a hummingbird, moving from flower to flower in a way that looks frenetic but betrays precision. Even when Wolfe uses the same symbols across several paintings, the effects are worlds apart. “You Don’t Understand Me” (2016) and “Target Practice” (2016) both make use of a target, for example. The former painting depicts thick black lines that make up concentric circles against a stormy wash of gray gouache on paper; the latter depicts a more representational target, like the kind you’d find at a gun range, painted over another atmosphere on aluminum panel. Those paintings and a few more might make a tight little show about the flexibility, ambiguity, or rigidity of old modernist trademarks. (The target belongs to Jasper Johns, of course, and by using it, Wolfe courts a direct comparison. More on that in a moment.) But for a gallery show, “Language of the Birds” is huge. There are nearly 30 paintings in all, and many more if you consider that three pieces—“Evolutionary Advantage” (2016), “History of Nature” (2015), and “Super Power Memory” (2016)—are each suites of dozens of smaller paper works (16, 53, and 108, respectively). One wall in the gallery is occupied by six variations on a theme, each one a print of ballerina, posed in the Arabesque form, and circumscribed within a thin polygonal line. 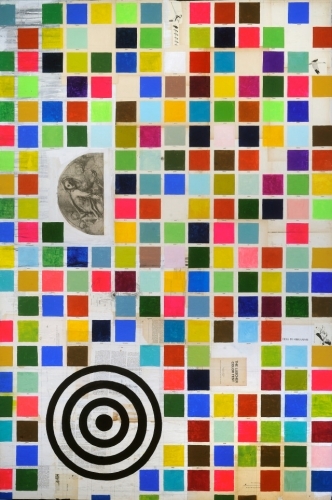 For these “Counters” prints (all 2016), the ballerina stamp is repeated across different planes of bold color; lurking amid them is a found x-ray of some kind of bird. Another distinct show within a show. “Audio Stroke 4” (2016) is the stand-out in “Language of the Birds” because it is cool, even cold. The piece features a dense cloud of white scribble over a plane of Yves Klein blue paint; it could be a piece of zombie formalism that you’d expect to see at any of the international art fairs. Compared with “Interrelated,” a gouache painting of interlocking finger forms and dots that resemble Henri Matisse’s cut-outs, it’s hard to believe they’re paintings by the same artist. “Audio Stroke 4” notwithstanding, there is a comic lightness that shines through all of Wolfe’s works (and even that darker painting has a nest-like quality to it). “In a Day” (2016), an almost Surrealist assemblage of little proto-life forms, brings to mind the compositions of Elizabeth Murray and Joan Miró. Yet this highly animated piece also resembles the work of Charley Harper, a cartoonist who made chuckle-filled, stylized prints of nature. Wolfe draws from both the canon (Johns and Delaunay) and commercial (Harper and prints). There’s so much comedy in Wolfe’s work that it’s easy to mistake her paintings as carefree. They are not that. Making paintings that feel aerial while borrowing directly from an eminence like Jasper Johns—those thick, black, concentric circles—is no mean feat. “Short Stories 1” (2016), a sculptural installation of color painted on found books, proves that she works deliberately, and with a light touch, across many media. It takes concentration to find such focused fun while surveying high modernism in all its forms.